I remember a time when I heard about paper dresses and thought it was the craziest idea ever. Now here I am making paper jewelry! Created with layers of paper and glaze, the finished project is firm enough to be sanded or drilled. 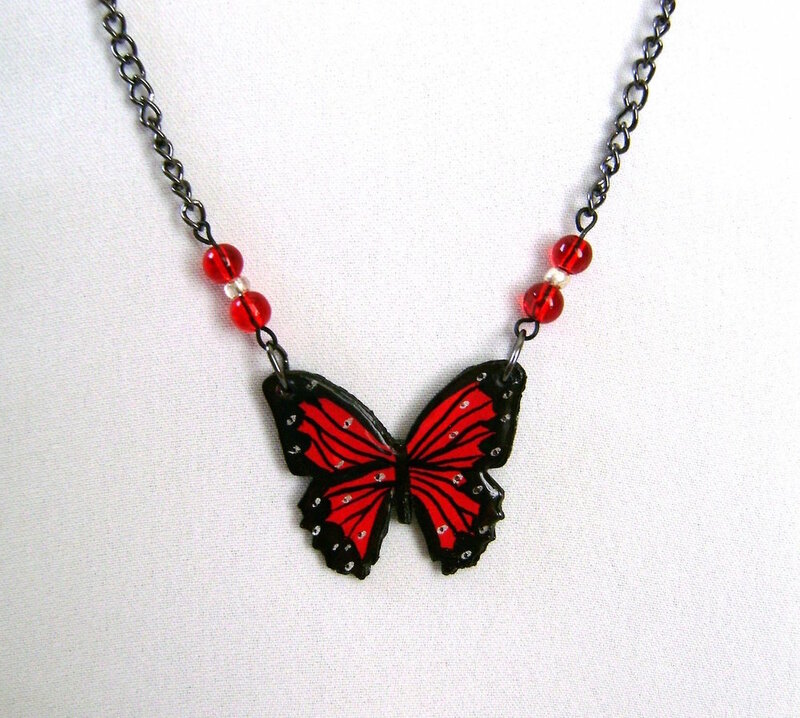 I chose a butterfly but there are many images that could be used to create this necklace. This project is so inexpensive and uncomplicated you’ll want to make several. COVER EXPOSED AREAS TO PREVENT ACCIDENTAL OVER SPRAY. ALLOW PAINT AND GLAZE TO DRY BETWEEN STEPS. Print the butterfly template page on card stock. Cut out the six butterflies with a craft knife or stencil cutting machine. step - Stack all six pieces, applying a thin coat of the glaze between each using a soft brush. step 3 - Paint one side of the butterfly with the black marker. Also run the marker along the edge of the butterfly. step 4 - Using the spout on the container, outline the edge of the black paint with glaze. The glaze will tend to fill in the outline. Add more glaze to the center to finish filling in the center. Pop any bubbles that might occur in the glaze with a pin. Allow the glaze to dry overnight. step 5 - Paint the reverse side of the butterfly using the red paint marker. step 6 - With the fine point black marker, create a vertical jagged line for the wing shape inside the paper edges. step 7 - With the black paint marker, fill in the space between the fine jagged line and the butterfly edges. Also place a black line down the vertical center. Draw fine lines from the black center of the butterfly to the outer edges with the fine point marker. step 8 - Dot the black borders with the corner of the silver marker to create detail. Place a few more dots in the red areas. Dot the silver with the fine point black marker. step 9 - Apply glaze as you did on the black side. Let dry overnight. step 10 - Drill a small hole in the upper corner of each wing slightly larger than the thickness of the jump ring. Cut the end off the nail head wire. step 12 - Bend one end over the sharp edge of the flat nose pliers to create a 90 degree angle. step 13 - Place the round nose pliers in the angle. step 14 - Bend the wire over the round nose pliers. step 15 - Bend the wire down flat against the pliers. step 16 - Cut the end of the wire off to create an open loop. step 17 - Hold the loop in the flat nose pliers and bend the long wire to close the opening in the loop. step 18 - Put a red, silver, and another red bead onto the wire. step 19 - Create another loop. To avoid excess space between the bead and the loop, bend the wire over the thin edge of a metal ruler or knife to create the 90 degree angle. Follow steps 13 through 16 leaving the second loop open to attach to the chain later. step 20 - Create a second bead section. Cut two pieces of chain 8.5” long. step 22 - Open a jump ring by holding one end stationary and pushing the other end away from you. Place the jump ring into the hole in the butterfly and into the closed loop of the bead section. Close the ring by holding one end stationary and pulling the other end toward you. 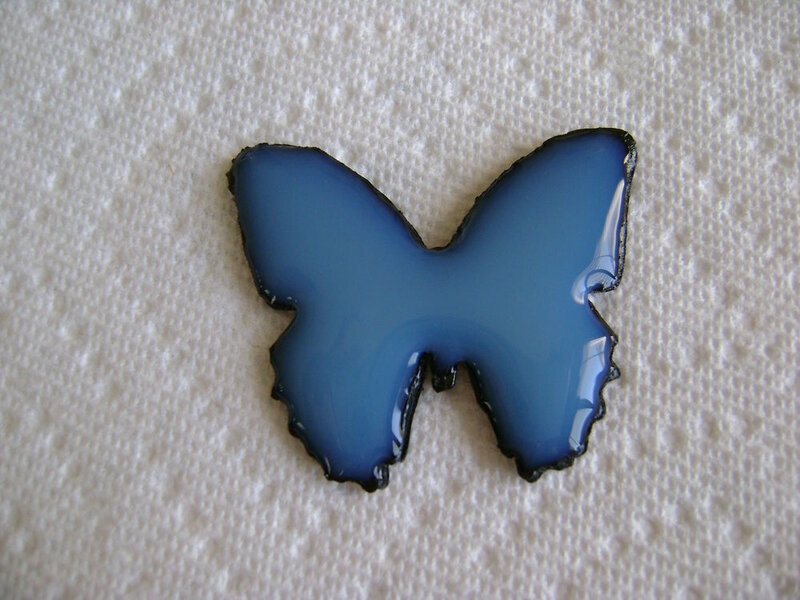 Repeat to attach the second bead section to the butterfly. step 23 - Insert the open loops of the bead sections into the end links on the chain sections and close the loops. step 24 - Attach a jump ring to one chain end and a jump ring and clasp to the other.